Sorry, the page that you are looking for can not be found. Try choosing something from the menu. Mr. Tata being extricated from his cold dark prison. 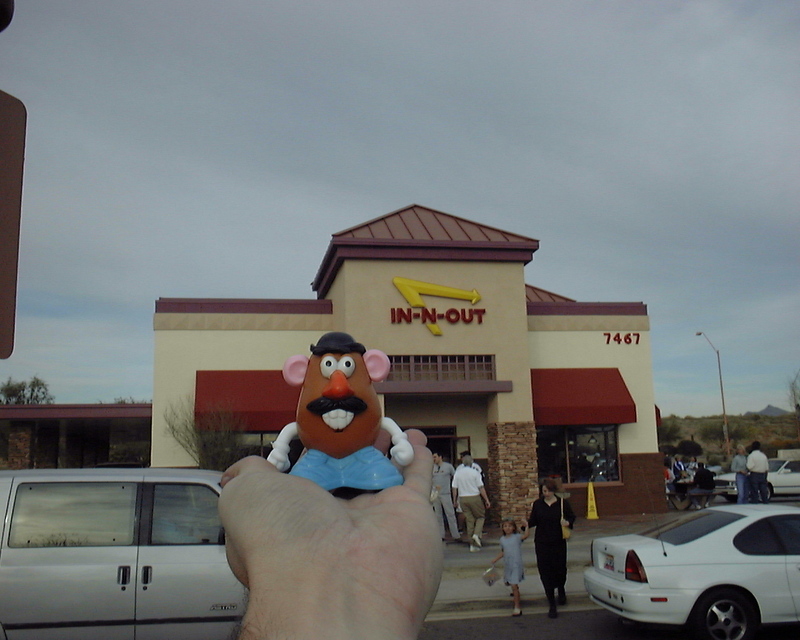 Mr. Tata smiles big, his first meal of the new millennium. 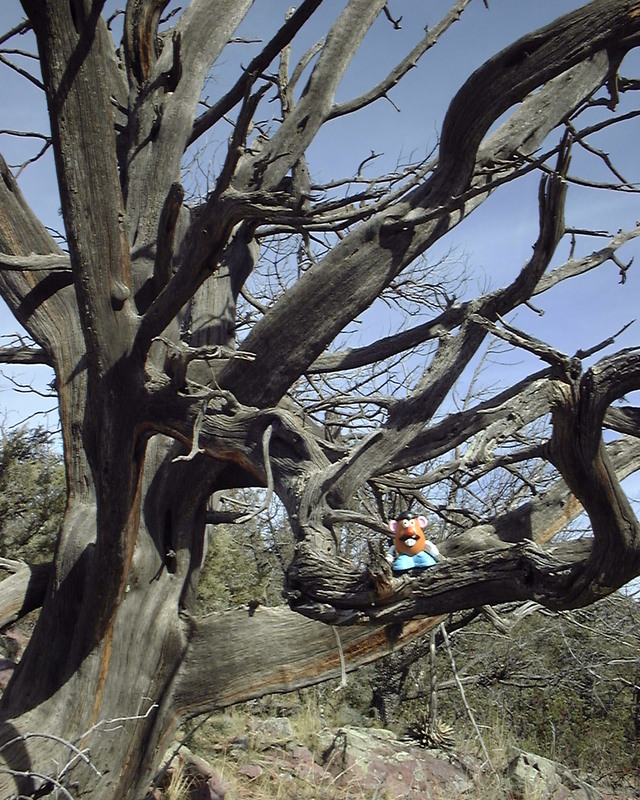 Mr. Tata posing in a scraggly tree near the Box Canyon Geocache. Mr. Tata Making sure his new diggs are up to par. Where abouts are currently unknown, we have not received any updates. he has finally been released from his prison. 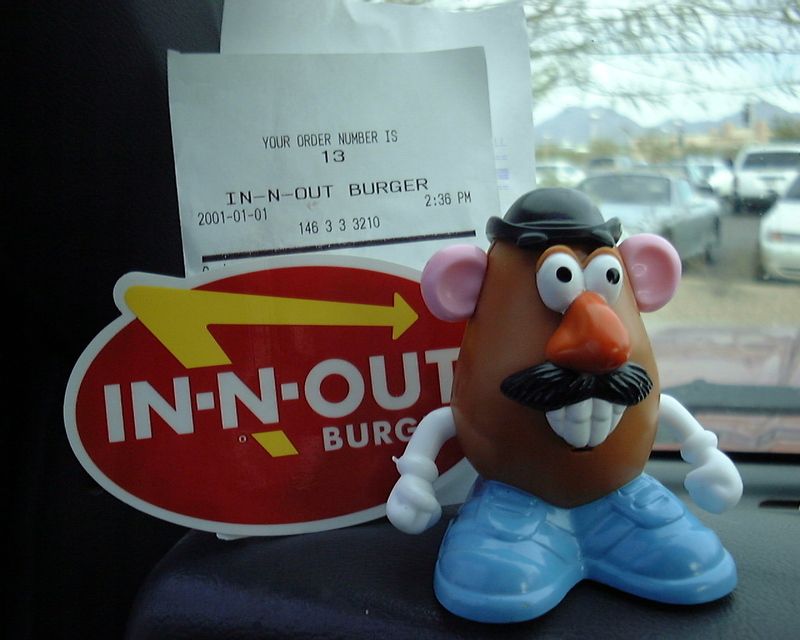 We all know Mr. Tata is a SPUD through and through and not a yam. Welcome to the new AzGeocaching.com. This is, I believe, the third time I've had the honor to announce a complete overhaul of this site. You may have noticed for the last couple of months that the site has been broken. Previous to that the website itself was not updated very often..
We'll, we had a forced move from our old server hosting facility, and when it came time to move the website to it's new home, we decided that it was time for a fresh start... and you're looking at it. 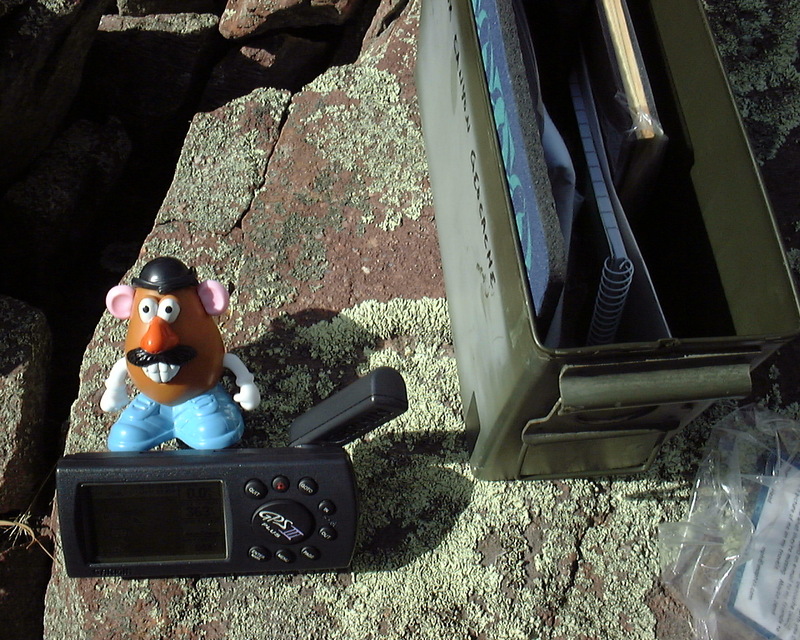 This new site should allow us to better serve the Arizona Geocaching community. This is a work in progress, so there is still a lot of content missing from the site that will still be moved over. Unfortunately, as of right now, the stats are not planned to be one of the features that gets moved over. 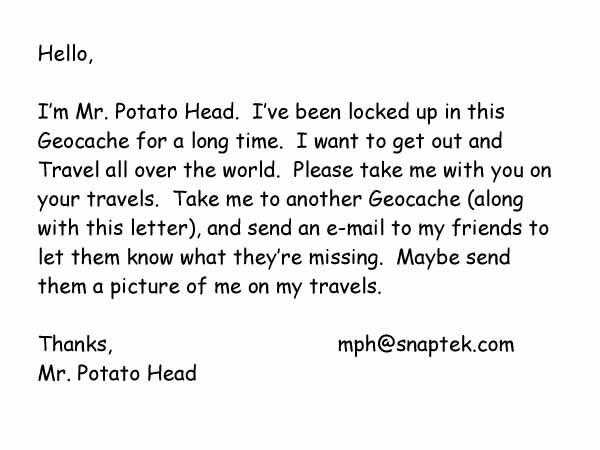 There is just too much work, and 10 times as many hoops involved to keep them anywhere near reasonably to date, and geocaching.com offers no support what so ever in making it easy for sites like ours to offer services that they aren't prepared to offer themselves based on the data that we collectively put in there. 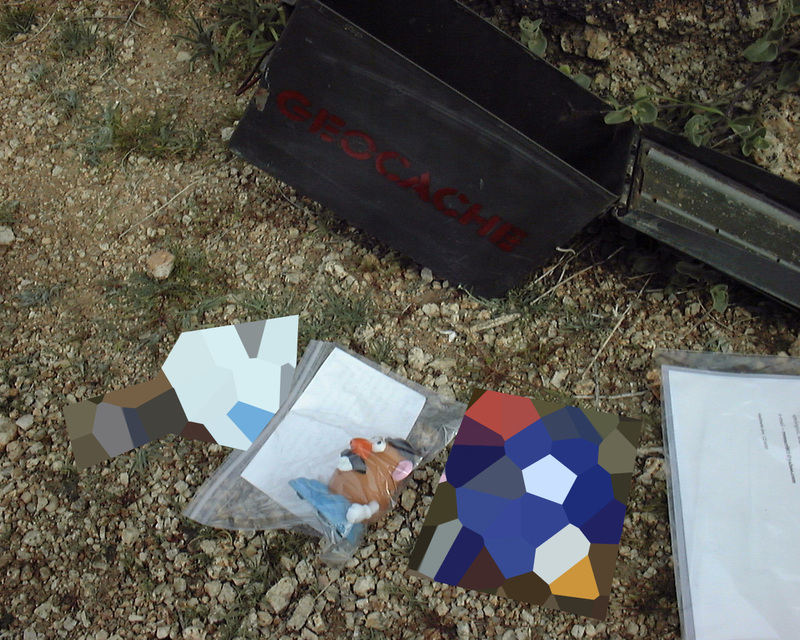 We appreciate all the time and effort everyone puts in to geocaching in Arizona. We would quite literally not be able to cache in Arizona without the people that this site brought together, and we hope to help as much as we can in the future. Team Nine Lives reported on the list that Continental airlines is now allowing the use of GPS onboard airplanes above 10,000 feet. When: Saturday, April 26, 2008 from 7 a.m. to 11 a.m. In coordination with Earth Day the Tempe Town Lake team is planning a Clean-up Day for Saturday, April 26, 2008. This is an annual event where we ask volunteers to help us spruce up a special area around the lake. We need volunteers to help pick-up litter, weed, sweep, rake, and generally spruce up Indian Bend Wash Habitat on the north east end of the lake habitat. After you sign-up, meet us at the Indian Bend Wash Habitat on April 26th where you will be given a specific area assignment. All equipment needed to clean the habitat will be provided to participants but we ask you to please bring a pair of garden gloves, sunscreen, and water. A bar-b-que hotdog lunch will be served after the clean-up with a raffle for fun prizes. For questions about the event call Diane at (480) 858-2188. April 22 is Cache In Trash Out Day! So... let's celebrate with another CITO event! Saturday, April 22nd is the date; 8:30am - 10:45am is the time. Plan on joining your fellow geocachers to pitch in and clean up the Beeline! The more people we have attend the more we will get done so come on out out! let's have this briefing right at the coordinates like last time (N 33° 29.750 W 111° 48.280) The briefing will begin at 8:30am to get instructions, vests, and bags, snap a group photo, sign forms/log book, etc. We will then get started and work till about 10:45 am or so.